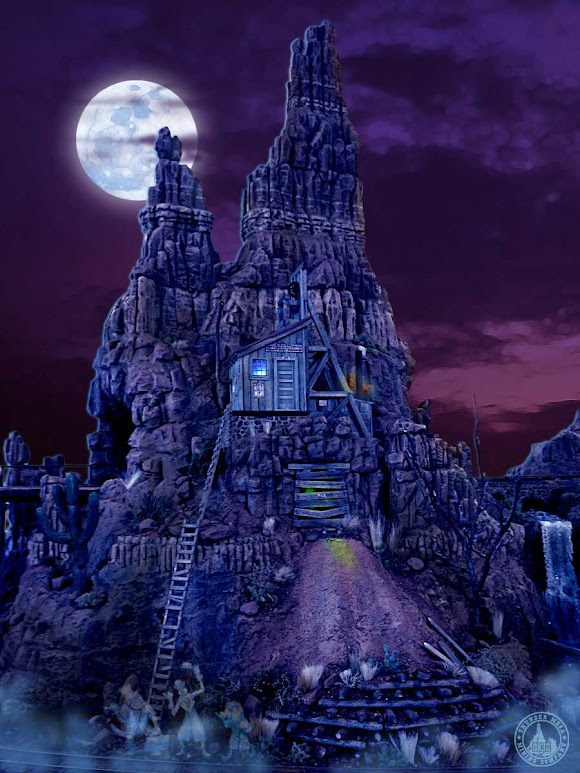 Grim Grinning Ghosts Come Out to Socialize with the Addition of a Haunted Mine Tunnel! Welcome foolish mortals, to the Never Mine! Happy Halloween! Just beware of hitchhiking ghosts! At the end of September I described building the shaft house and head-frame of the spooky, abandoned Never Mine. 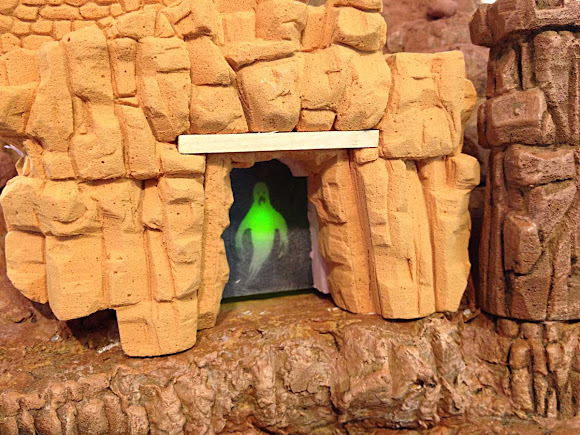 In today's post I'll detail construction of the mine tunnel base, including the addition of a happy haunt who only comes out after dark. Then we'll finish up the scene with a tailings pile, timber crib retaining wall, and all of the final landscaping details. Follow along with the photos and captions to see how it all went together. 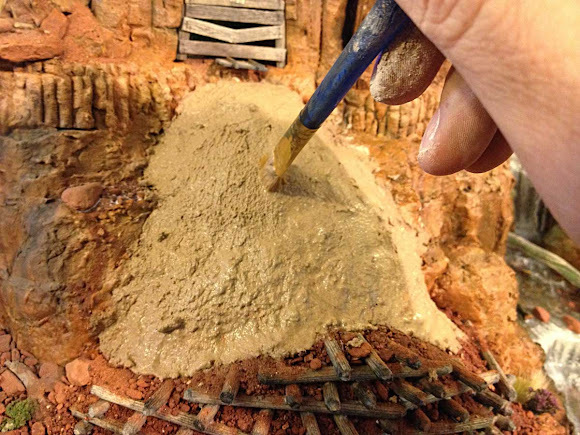 The base for the Never Mine was carved from two layers of 1" thick Balsa Foam laminated together with wood glue. Most of the carving was done with #2 and #11 hobby knives and a hard, 5H pencil. A random stone foundation for the shaft house was integrated into the carving. 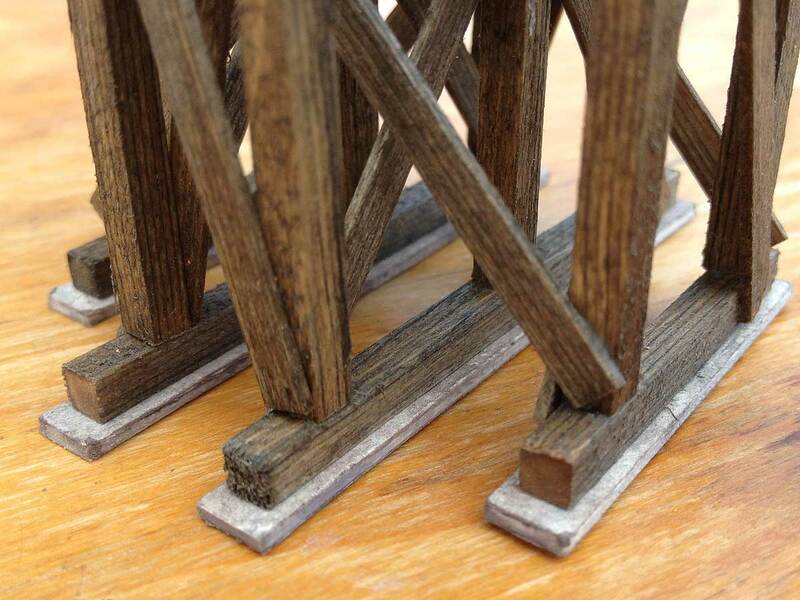 Here I'm test fitting the top beam of the timber framing for the mine adit. For my happy haunt, I cut some 1mm clear acrylic sheet to size and fogged the surface with fine sandpaper. Then the outline of the ghost was painted from behind with thick black acrylic paint. 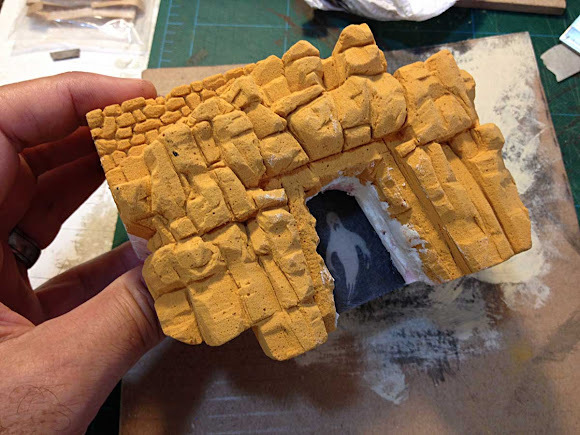 The acrylic sheet was cemented into place and all of the edges blended with spackle. A hunk of Baxter's Butte was cut away and a simple power bus made from two strips of thin brass sheet was glued in place. 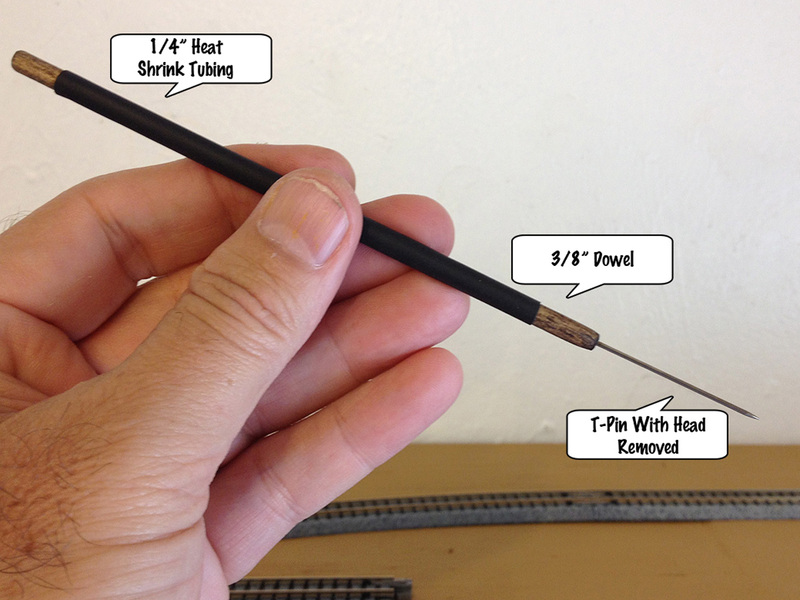 Accessory power from a 9v transformer feeds this bus and all wiring leads from the model were soldered on to it. Special care was taken to keep track of the positive bus as LED lights are polarity specific and will not function if the positive diode receives a negative charge. Here a 5mm green LED has been soldered into place to illuminate the ghost. A quick check to make sure everything would fit and work properly. The carving was painted with acrylics to match existing rock-work on the layout and the mine adit was finished with scale 8' x 8' beams and 1" x 12' planks stained with a shoe dye and alcohol mixture. The boards were distressed and broken to look as if they have been there for some time. 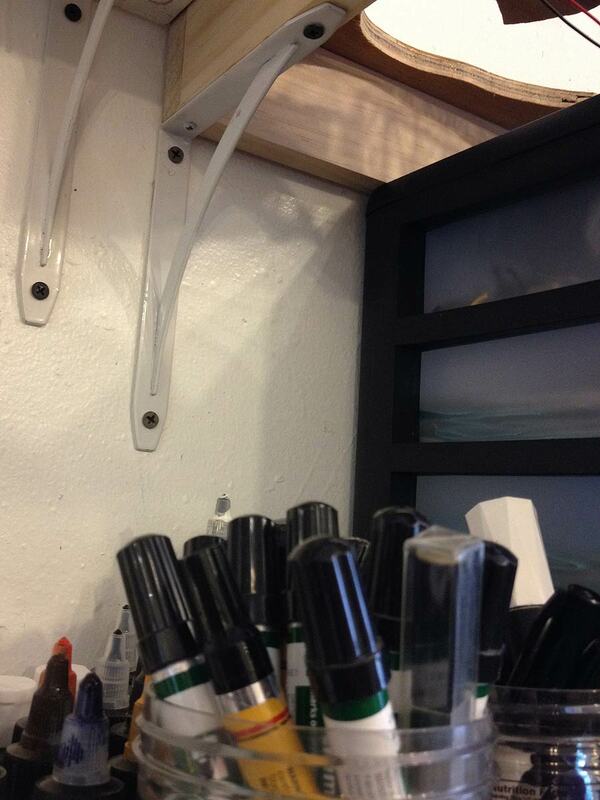 The nail holes were added with a sharp 5H pencil. 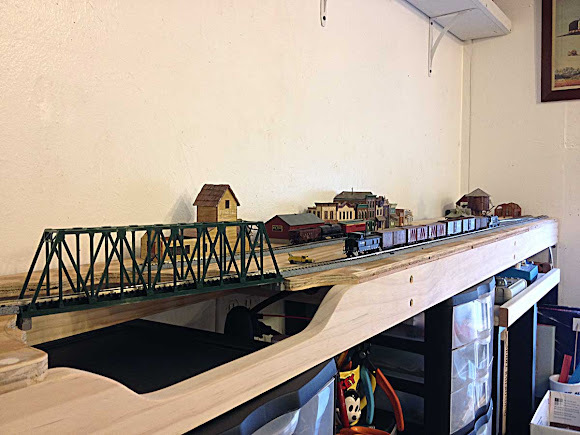 Here is the entire assembly installed on the layout and the lights turned on. 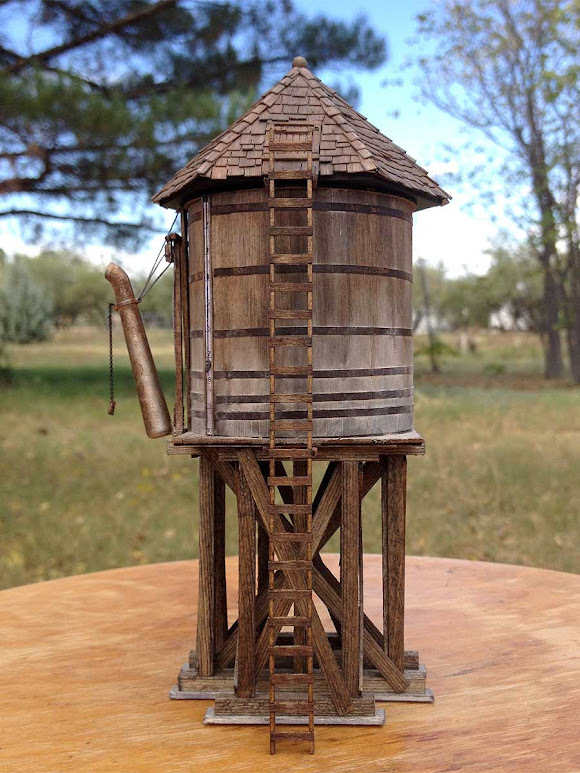 The shaft house has a single blue LED and the hoisting shed has a flickering amber LED as described in part I. 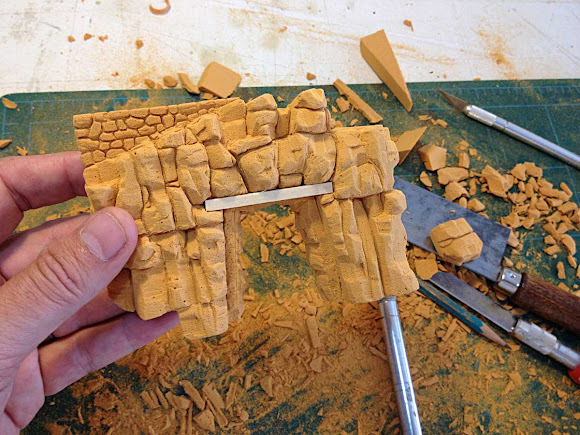 The carved base was glued down and blended into the existing scenery with Sculptamold. 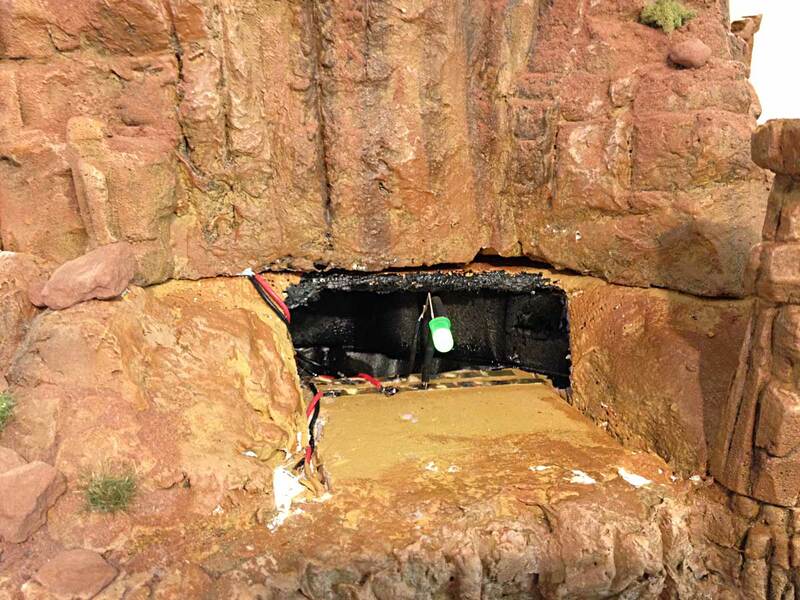 The mine structures above merely sit in place and can be easily removed if required. 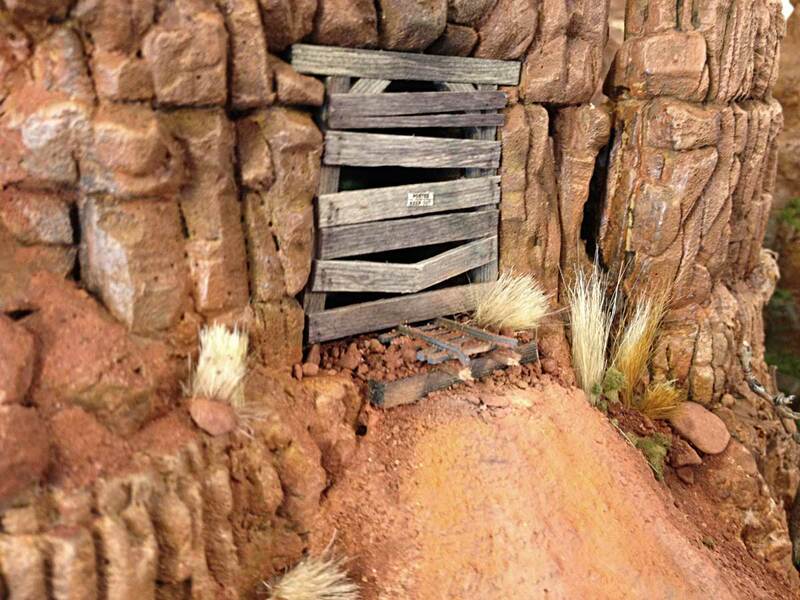 A short length of Micro Engineering code 55 N scale bridge track was added to represent O scale 18" gauge mine car tracks emerging from the tunnel. 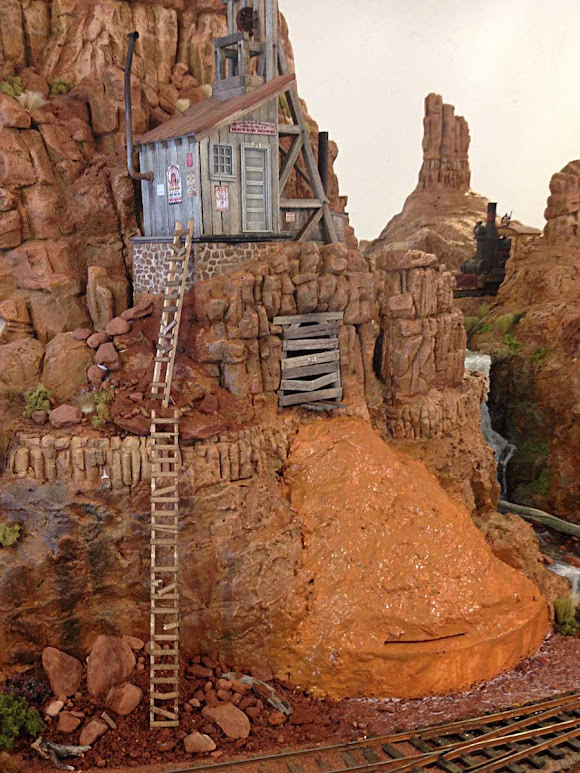 I had originally planned to build an abandoned ore tipple to go with the Never Mine but later decided that such an imposing trackside structure would detract from the tiny mine above. Instead I opted for a timber crib retaining wall and tailings dump - a very common site around old mines. The first step was to rough in the dump pile with EPF (pink foam). Here the tailings dump has been smoothed out and blended into the cliffside with Sculptamold. It was then given just a quick coat of Raw Sienna since this base will be entirely covered by scenery materials. A couple of rickety, broken old ladders were scratch-built from strip-wood to provide a way up to the mine - albeit a hazardous one. It's nothing but fun to build details like this. The timber crib retaining wall was built in place from 3/16" diameter dowels, stained and distressed to resemble old timbers. Here I'm backfilling behind the cribbing with small rocks and dirt from Sedona, AZ. This was later cemented in place with diluted white glue. The slope of the tailings pile was textured with Polyblend sanded grout. 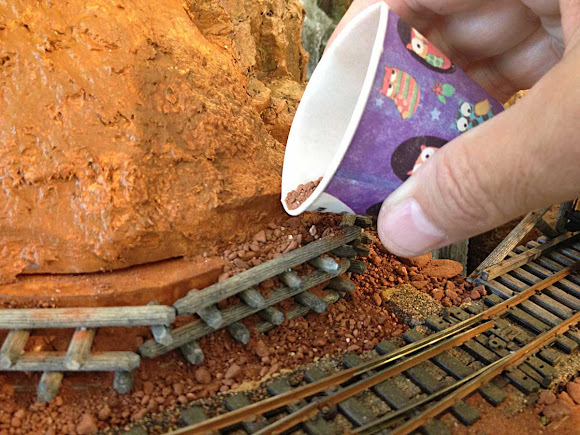 It was mixed in a paper cup with a small amount of water to form a thick paste and then stippled on with a cheap paintbrush. The grout was allowed to dry for a couple of days and then it was stained with thin washes of acrylic paints to represent colorful minerals, and to blend it with the surrounding scenery. Another layer of fine rocks and dirt was sifted over the tailings pile and cemented into place with diluted white glue. Then more rocks, bushes, cacti, weeds, broken boards and other miscellaneous bits of debris were cemented in place to finish up the scene. Cacti, bushes and other details near the shaft house foundations. You'd have to be pretty brave to climb those ladders! 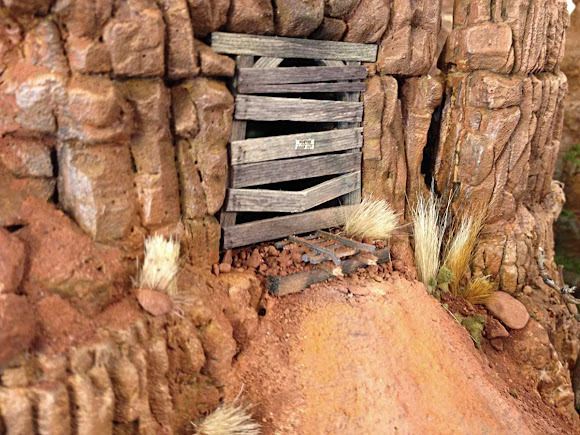 The boarded-up mine entrance. The ghost is invisible during they day and only appears when the structure lighting is turned on for night operations. Overall view if the tailings pile. The weedy overgrown look contributes to the story of a mine that has been abandoned for some time. With the completion of the Never Mine, just about all of the scenery is now finished on this side of Big Thunder Creek. 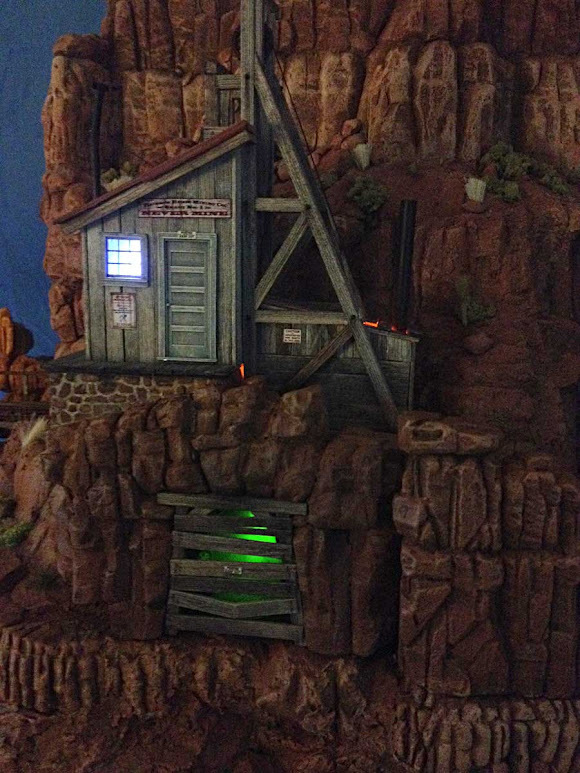 I'm sure that a few more details will be added here and there, but I was happy to get the haunted mine finished just in time for Halloween. 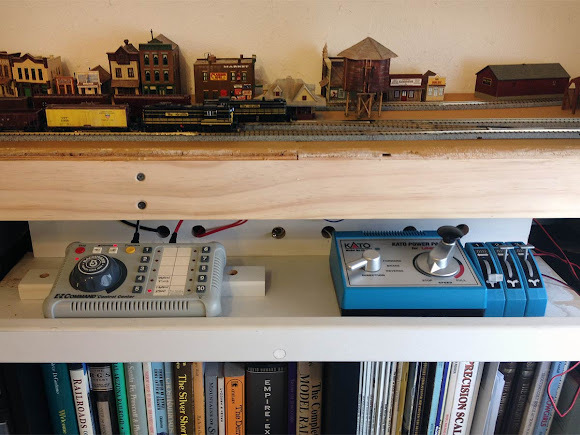 I had considered adding a sound module to this project but decided it would be a little too much with the sounds of the creek, mill and town right next door. Hope you've all enjoyed the tale of the Never Mine and following along with the build. As always, any questions or comments are more than welcome below. More to come real soon. In the meantime, here's a video showing the lighting effects and documenting the Never Mine build. Adios for now! The sleepy border village of San Lorenzo. 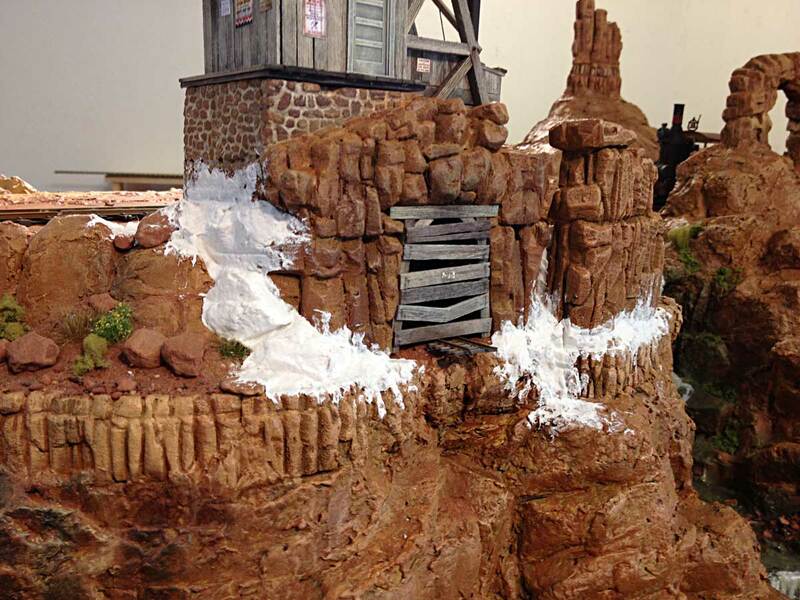 This award winning diorama by Verne Niner will soon find a new home on the Thunder Mesa layout. Photo by Verne Niner. 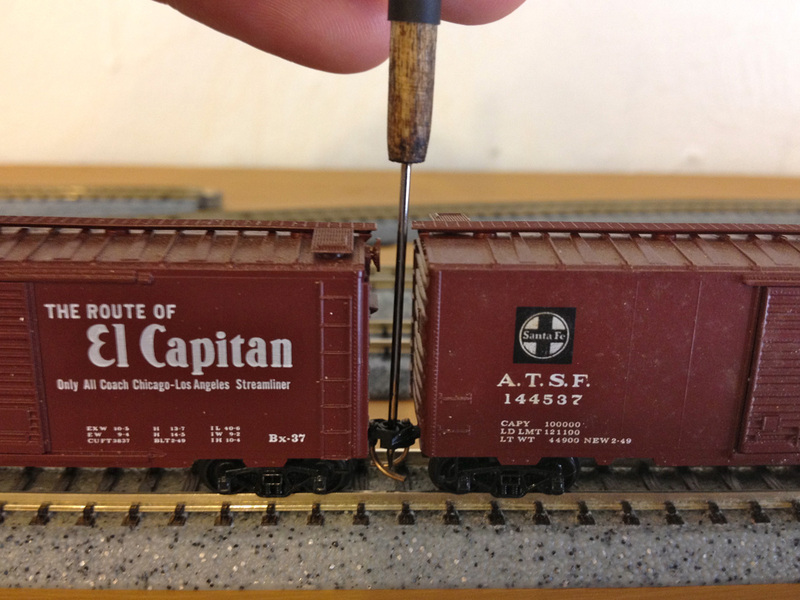 When friend and fellow modeler Verne Niner recently announced that he would be dismantling his Estrella & Sonora Grande layout to pursue new adventures in HOn3, many wondered what would become of the superlative structures, fine details and beautiful equipment from that landmark On30 layout. 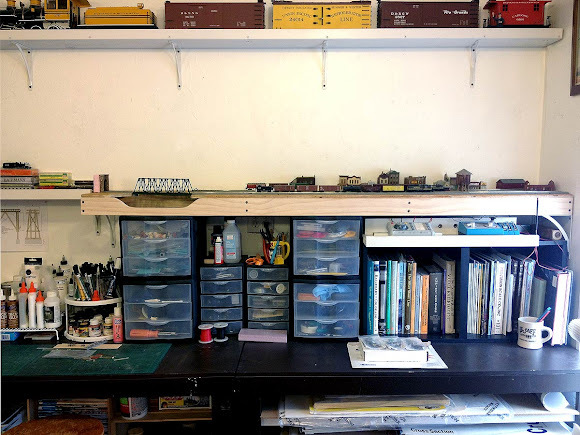 Well, the short answer is that Verne will be selling off most of the layout to other modelers before finally dismantling it at the first of next year. 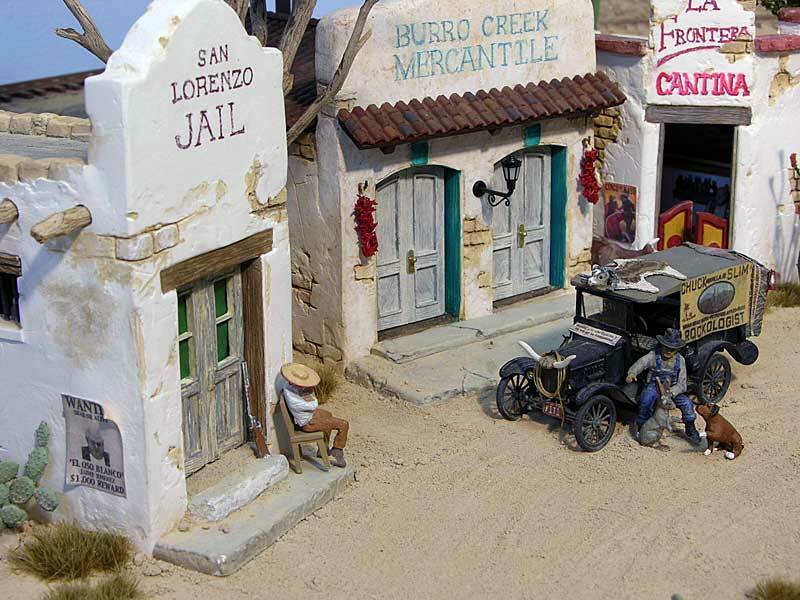 I was fortunate to come to an agreement with Verne regarding a large chunk of the layout, the village of San Lorenzo. I knew that the diorama would make an excellent addition to the TMMC and I simply could not pass on the chance to own such a beautiful and detailed piece of modeling. It is sad news indeed that Verne's E&SG will soon be history, but we're both happy that the spirit will live on as TMMC trains continue to visit San Lorenzo. The colors, theme, details and scale of the scene makes San Lorenzo a perfect fit for the Thunder Mesa layout. Photo by Verne Niner. More San Lorenzo details. The frustrated banditos may never get that pig out of the fountain. Photo by Verne Niner. The San Lorenzo diorama measures 18" x 30" and features four custom soundtracks in addition to an amazing level of detail. A Fantasonics unit plays the sounds of splashing water in the fountain, ringing mission bells, neighing horses, singing birds and the banditos threatening the pig - all at the touch of a button. Details abound. 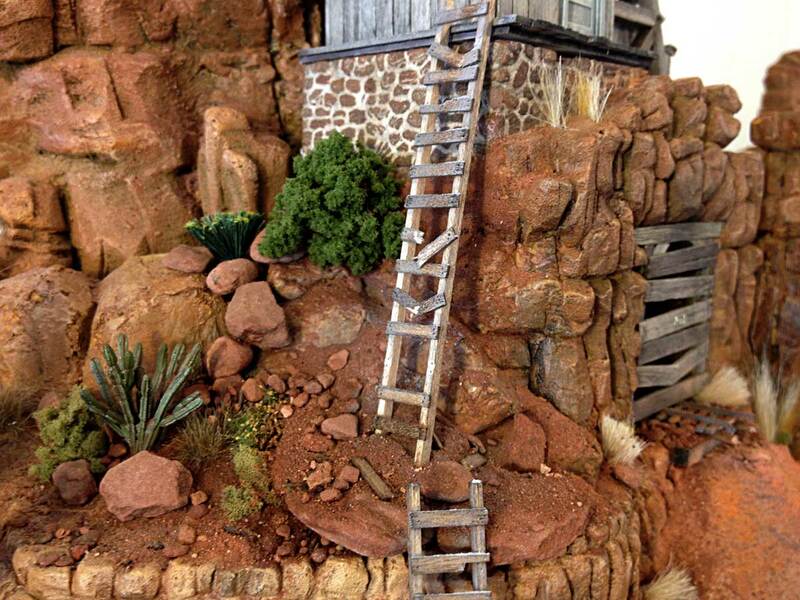 A diamondback rattlesnake slithers through the bushes, a hawk perches atop a saguaro, and rock hound Chuckawalla Slim's Model T truck pauses by the Mercantile. 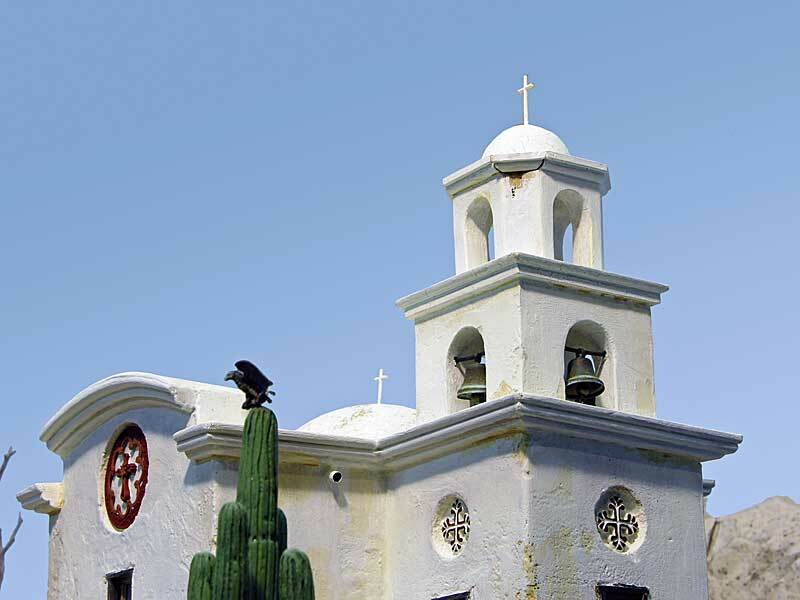 Above all, the mission church is a remarkable feat of scratch-building, complimenting and contrasting with the smaller, secular buildings of the village. Everything works together here in the best tradition of modeling as story. 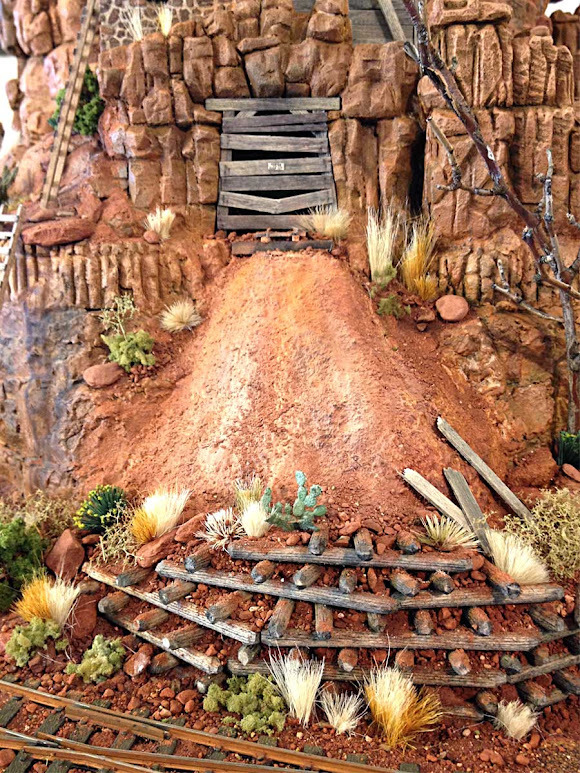 It is no wonder that the diorama won the 2013 Gazette Award at the 33rd annual Narrow Gauge Convention in Pasadena and was featured in the Jan/Feb 2014 Narrow Gauge and Short Line Gazette. 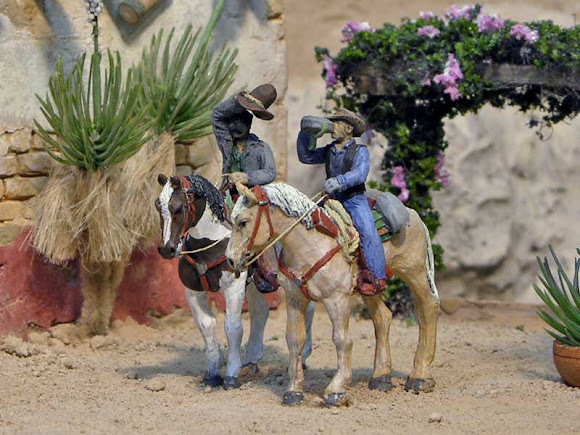 Thirsty cowboys pause for drink of water near the mission ramada. Photo by Verne Niner. 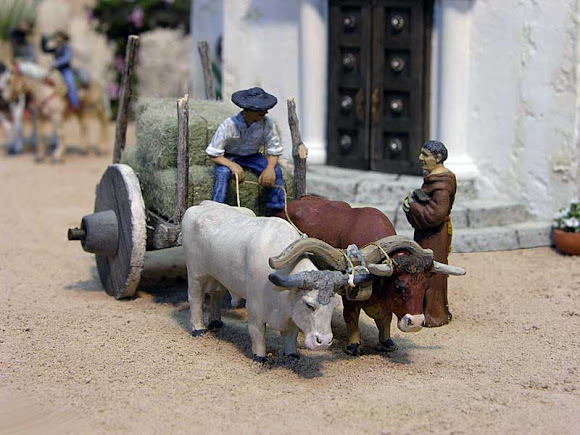 A local farmer stops to chat with the padré, his traditional oxcart loaded with bales of hay. Photo by Verne Niner. Detail of the mission doors. Photo by Verne Niner. Bell tower of the mission church. Note the Harris hawk perched atop the saguaro - a common site in the Sonoran Desert. Photo by Verne Niner. 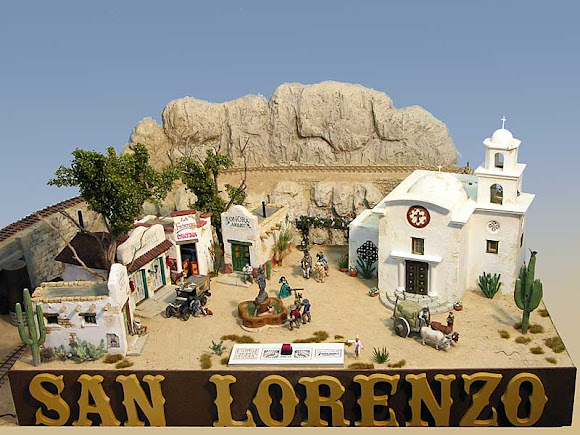 I know that the San Lorenzo diorama was a real labor of love for Verne and I am honored to be taking stewardship of it. San Lorenzo will remain whole and intact on the Thunder Mesa layout, an important stop along the line, and a tribute to the old E&SG. Some pieces from Verne's On30 collection are still available as of this writing, but they are going fast. Click here if you are interested in owning a piece of Estrella & Sonora Grande history. 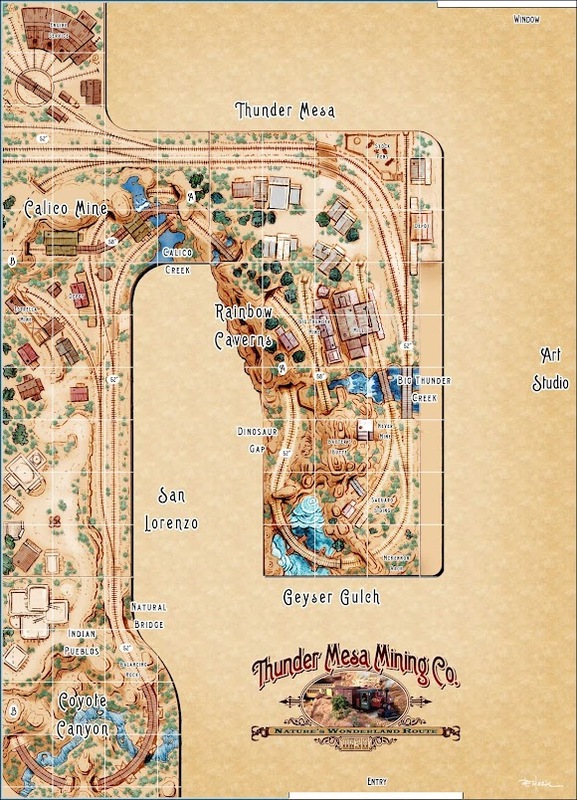 As Verne and I discussed the future of San Lorenzo, we've also been swapping ideas about his planned HOn3 D&RGW layout and about the expansion plans for Thunder Mesa. I have been somewhat discontented with my overall plan and the few tweaks I've made here and there haven't resolved the larger issues. 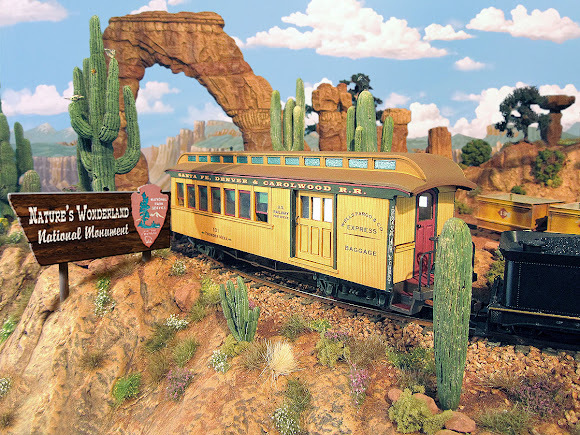 In its original form, the TMMC was a very simple 3' x 6' scenic display with a loop of track. It was what is known as an "island design" meant to be viewed from all sides. This type of design has fallen out of fashion in recent years with most modelers now preferring an "around the walls" style plan. This makes sense because island designs take up a lot of space in the center of the room and, the theory goes, you can get more railroad in the same space be wrapping the track around the walls and leaving the center open for operators, namely, you and me. 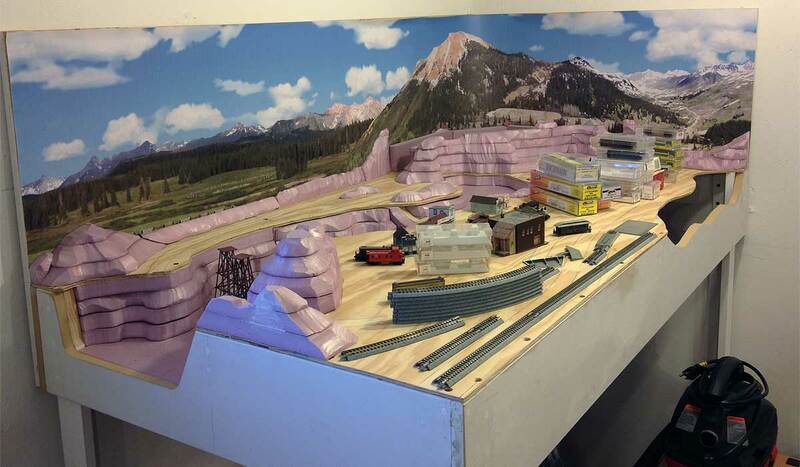 I also suspect that the move away from island style layouts has something to do with some modeler's desire to distance themselves from the perception that they're just "playing with a train set." Fortunately, I've never cared about such perceptions and am the first to admit to having a heap of fun playing with trains. Anyway, in my quest to expand the layout from its original island I've mostly focused on trying to morph the plan into some semblance of an around the walls design. This has been a largely frustrating exercise because the two design styles have such different requirements. I finally got to the point where I was almost ready to tear out everything I've already built and start over again from scratch. Surely a true around the walls style plan with shadowbox type modules and a nifty lighting valance would be much more sensible, wouldn't it? Then Verne said something that made everything click into place. 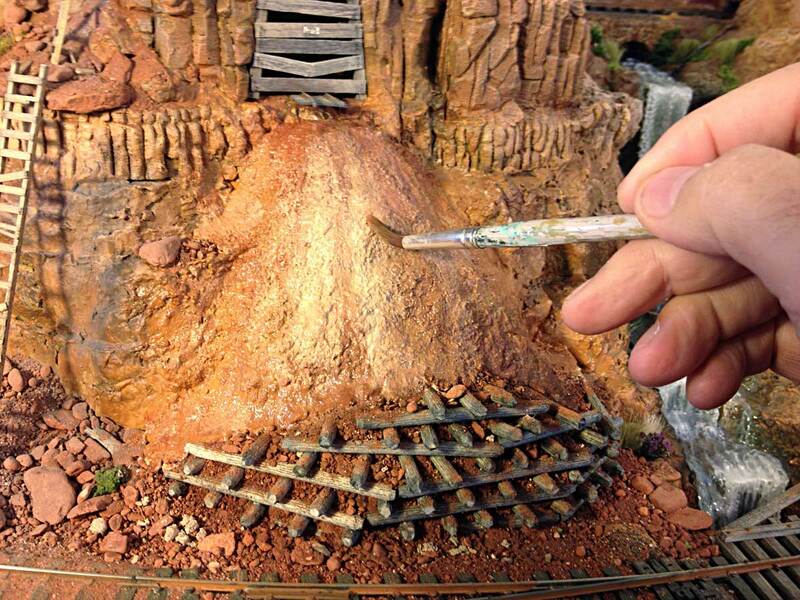 He said that Thunder Mesa has depth. Yes, scenic depth is exactly what you get with an island style design and exactly what you often lose with boxed-in shelves along the wall. Eureka! Turns out I really like depth, which, along with dramatic vertical separation is one of the defining characteristics of my particular modeling style. So it was back to the drawing board again. 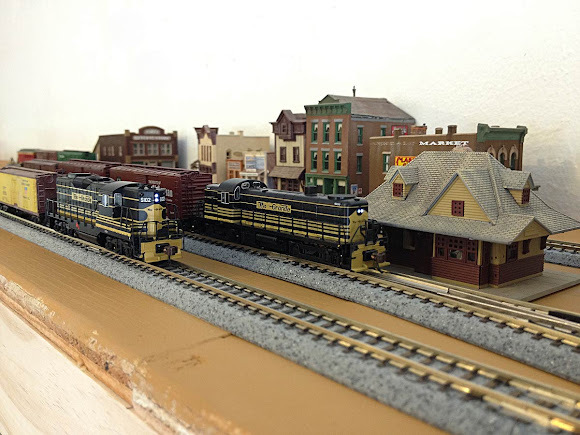 I was already drawing up a new plan to work San Lorenzo into the layout and to take advantage of the space recently vacated by the N scale Pagosa & Southern. I took the opportunity to create something with maximum scenic depth and multiple viewing angles for the Thunder Mesa island. Moving the Thunder Mesa section out from the wall also opened up much needed space for the town, passing tracks, yard and engine facilities. 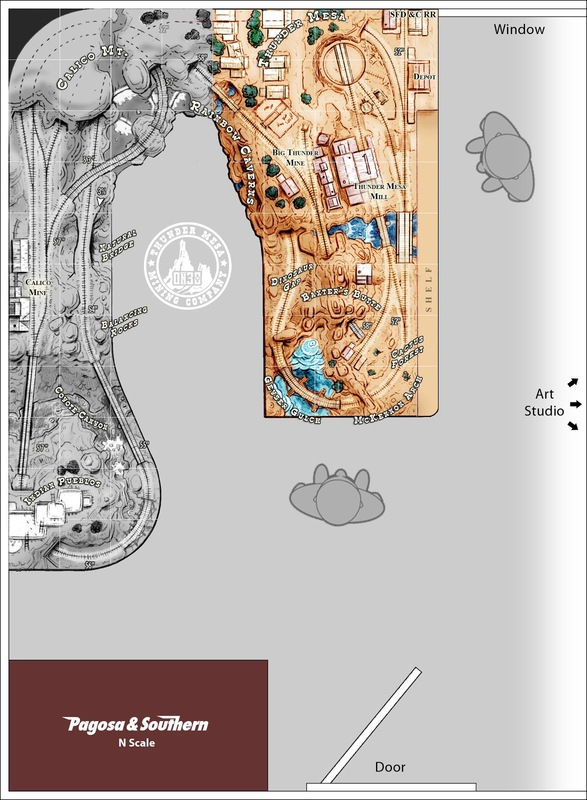 The focus is on scenery, structures and continuous running on this folded dog bone style plan. Room for a new engine service facility at upper left was an unexpected bonus. Grid spacing on the plan is 12". Aisle width is 30". The thin blue line represents an around the walls backdrop. Tip: to see the plan full size, right click and choose "Open link in new tab." 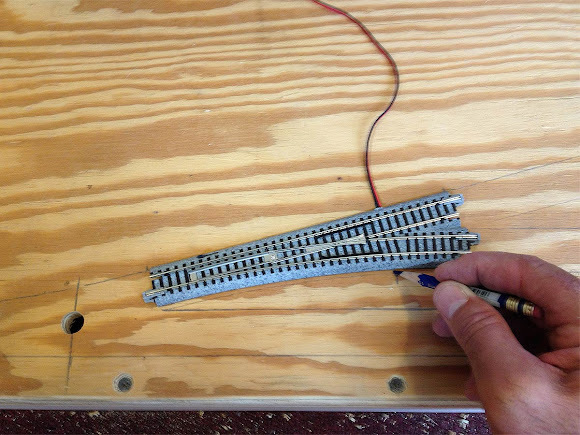 If I were to list my model railroading interests in order of importance, "scenery" and "structure building" would be way up at the top and "realistic operations" would be down somewhere near the bottom just above "wiring." Truth is, I'm much more of a model builder than an operator of miniature railroads and that's just fine. I like nice looking trains rolling through amazing scenery. This new plan is designed to emphasize those druthers while making the most of my art studio's givens. The mainline is about as uncomplicated as I can make it, with trains starting and finishing their runs in good old Thunder Mesa. I might add a couple of hidden staging tracks under San Lorenzo but that's still up in the air at this point. The Calico line is separate once again and stays up high to twist and turn through Calico Mountain on some 12" radius curves. It now transfers ore to the Thunder Mesa line via a tipple. The village of San Lorenzo is featured on a high bluff above the tracks, and will be complimented by the Indian Pueblos on one side, and the mining camp of Estrella Gulch on the other. 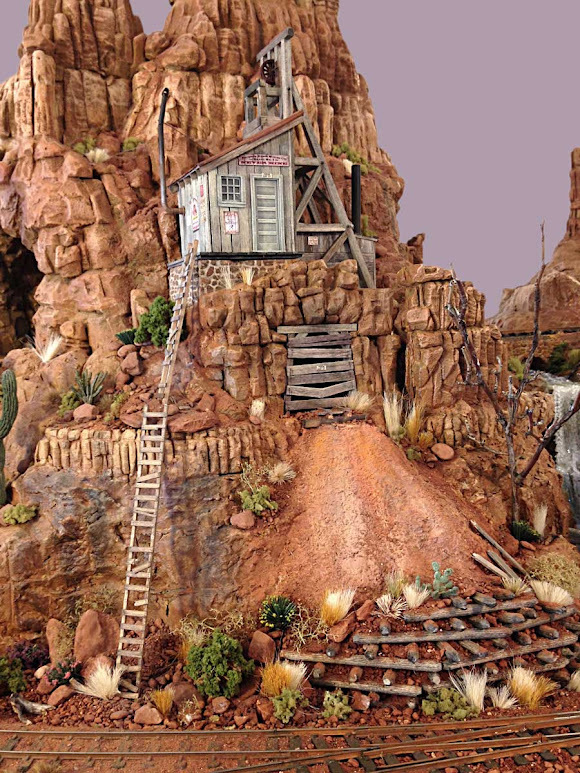 Coyote Canyon will be a very dramatic scene with a high steal viaduct, natural bridge and teetering hoodoos. 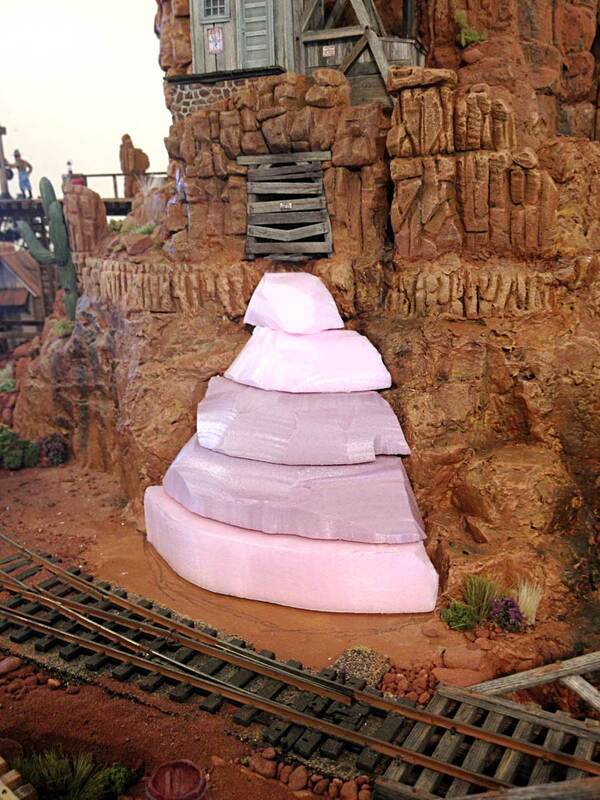 The town of Thunder Mesa will be rotated and moved down slope a bit, closer to the tracks for better viewing of the detailed structures. Another bonus of this plan is somewhat wider radius curves on the new sections. I'm very happy with the new plan and think it offers just the kind of modeling opportunities and challenges that I want. The scenes will be detailed, layered and deep, with a wall-mounted backdrop wrapping around on three sides. I'm also thrilled to be bringing San Lorenzo over to Thunder Mesa country. I was planning on modeling a sleepy border town and Verne's excellent diorama fits the bill perfectly. I want to thank the readers of this blog who have followed along through all of the changes and twists in the design process. There are a few central ideas that I've been drilling down to and I think I'm getting much closer now. As always, question and comments are welcome below. Adios for now, amigos! 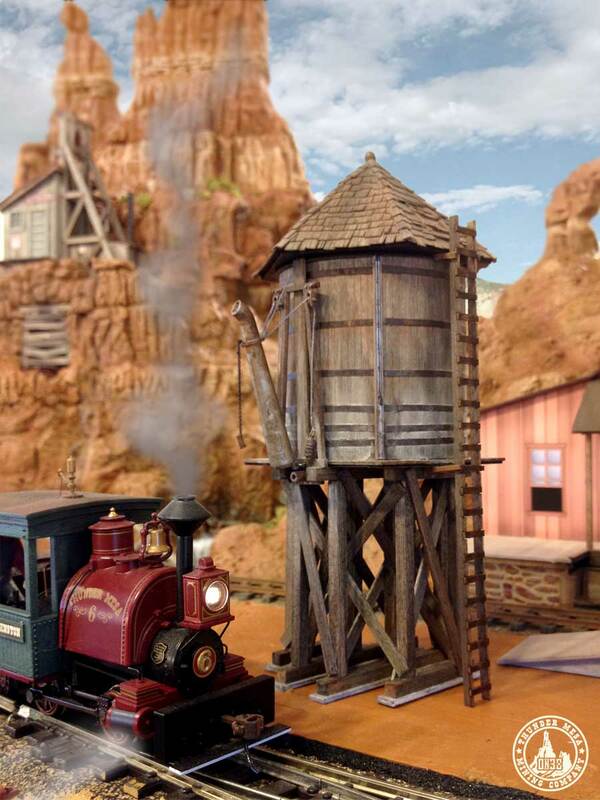 Engine #6, Ollie Johnston, pauses to take on water at the Thunder Mesa tank. 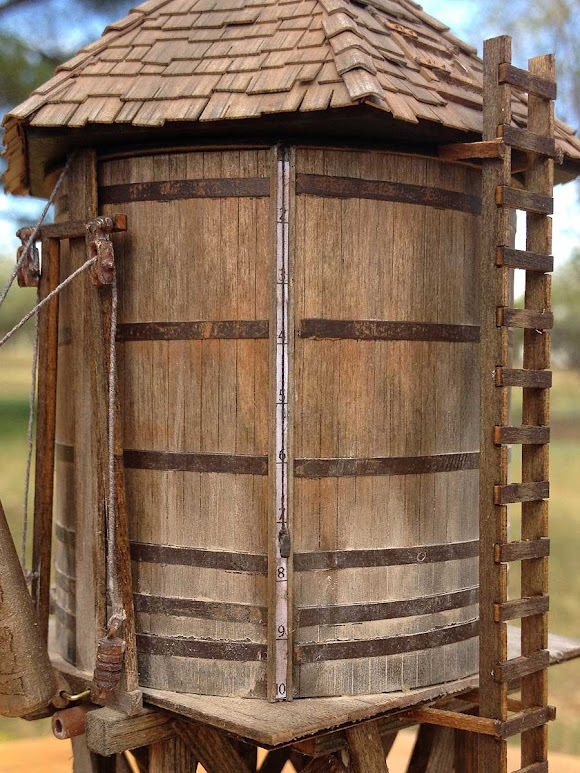 The tank draws its water from the same spring that feeds nearby Big Thunder Creek. It looks like there's still some scenery work to do in this area. I often work on several projects at the same time. Some get finished in a week or two, while others get dabbled on over the course of months. 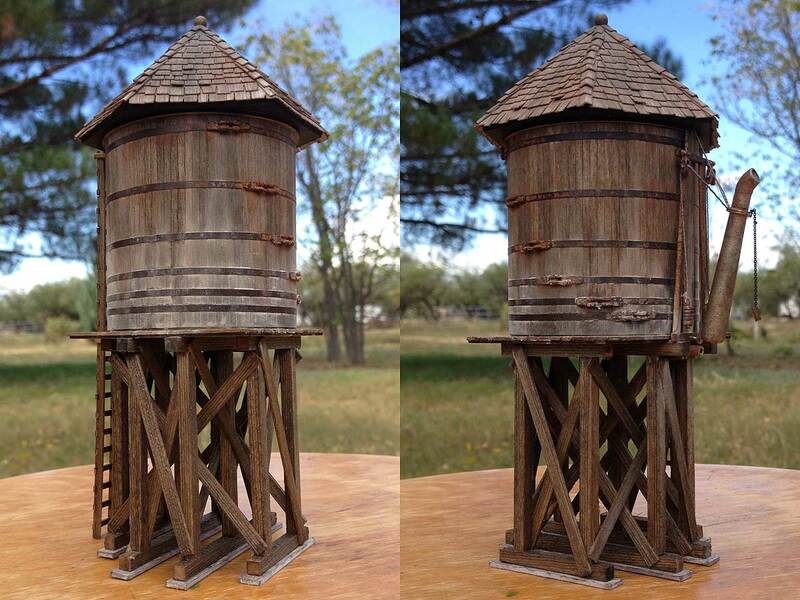 This water tank project was started last spring but I wanted to complete it as part of the larger Big Thunder Creek project that's been occupying my modeling time for the last month or so. The tank stands just next to the creek, west of the depot in front of Thunder Mesa Mill. I started with a Branch Line Water Tank kit from Banta Modelworks. 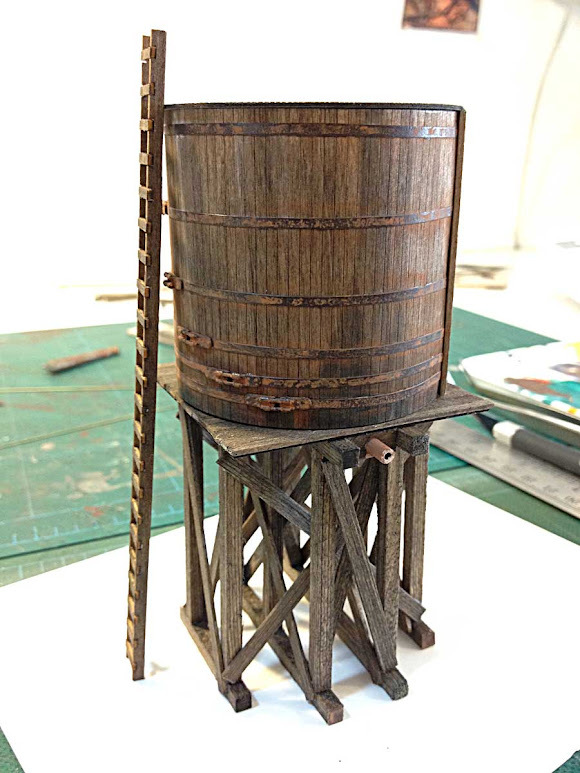 This is a nice laser cut wood kit that builds into an attractive model. The smaller dimensions of the tank are a good visual fit with other structures on the TMMC, but I wanted a little more character in my tank so I added a peaked roof and some other details. 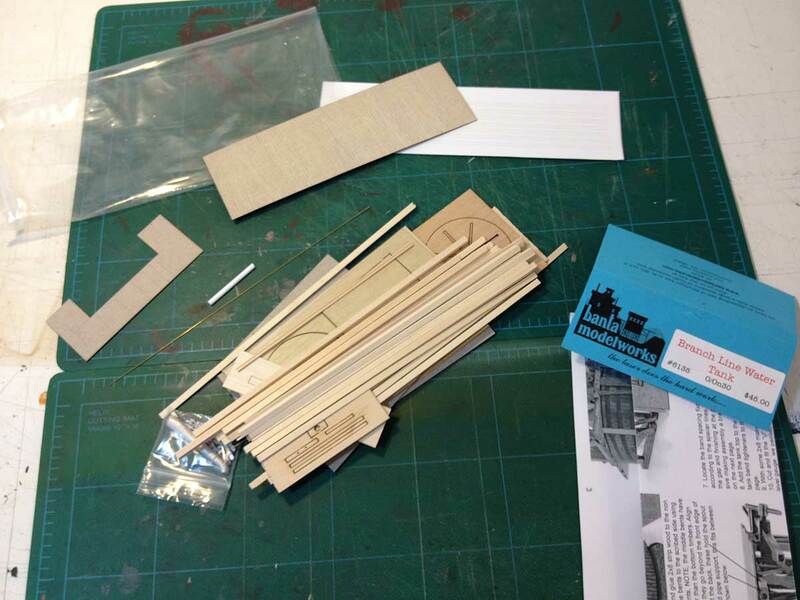 Here's what comes in the package: some strip-wood, scribed siding for the tank, laser cut plywood pieces, a couple of handy jigs, laser cut adhesive paper bands, and white metal castings for the spout and other hardware. 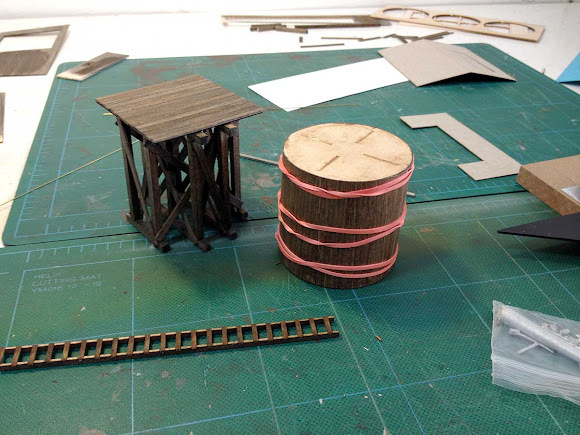 The kit uses a clever laser cut plywood form to build the tank. Following the directions, I stained all of the wood prior to assembly. I used Minwax wood stain pens on this one, mostly Dark Walnut and Early American. All the wooden pieces assembled. With the included cardboard jigs, this only took a couple hours. Rubber bands were used to clamp the tank wrapper in place on the plywood form while the glue dried. I followed the instruction up to about this point on the assembly, then I went off on my own. The tank bands are laser cut, adhesive backed paper that was airbrushed a dark reddish-brown before assembly. The rust is colored chalk mixed with rubbing alcohol and applied with a brush. 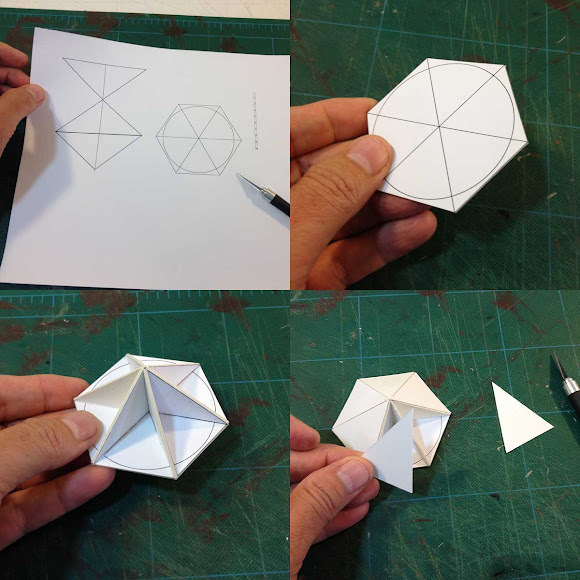 I laid out the pieces for a hexagon shaped roof in Adobe Illustrator. These were printed out and then laminated to 1/16" illustration board using a spray adhesive. 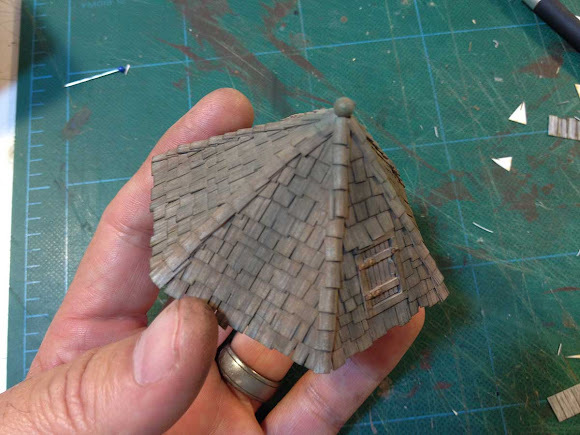 When cut out and assembled I had the basic shape of my roof. Triangular roof panels were then cut from 100 lb bristol board and glued into place. 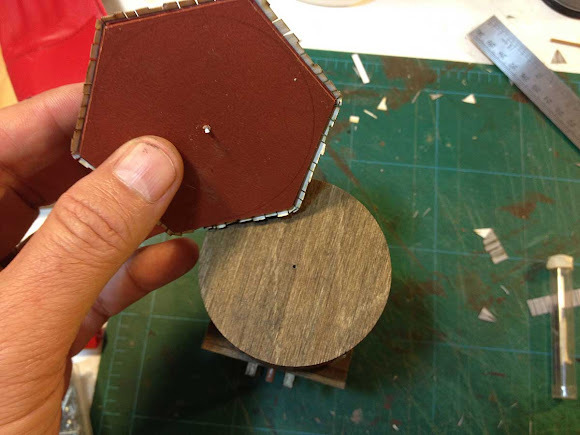 I chose a hexagon shaped roof due to the small size of the tank. The panels on an 8 sided roof would have been too narrow to allow for an access hatch. A hatch was built up from strip-wood and bits from the scrap-box before being shingled with Bar Mills laser cut paper shingles. The finial ball is the head of a large dress-pin. 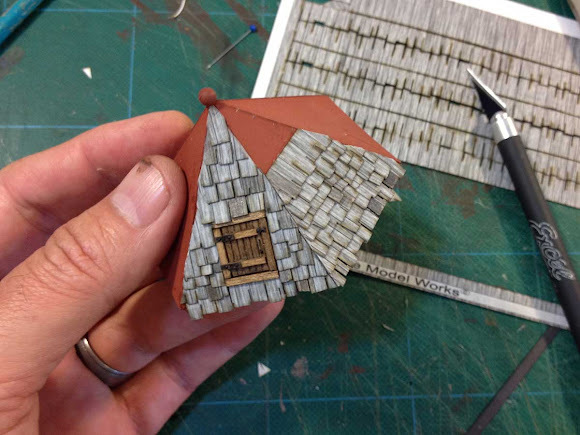 The Bar Mills shingles looked much too garish on their own so I dulled them down with a heavy dose of powdered chalks. The finial ball was painted metallic copper and then given a patina with dry-brushed dark green paint and chalks. To make it easier to center the roof on the tank, a hole was drilled in the center of each and a small metal pin was inserted to align the two. Some wooden channel is provided with the kit to make a water gauge, but no markings or hardware come with it. I created gauge markings on my computer to fit in the channel, and a pointer from the head of a rail spike. The spike fits into a hole drilled in the tank and keeps the black thread taut as it runs up the length of the channel to disappear under the roof. The spout, pulleys and hanger assembly were put together more-or-less as the instructions indicated. One nice detail from the kit I had to omit was the plug pull since that would be hidden by the roof. 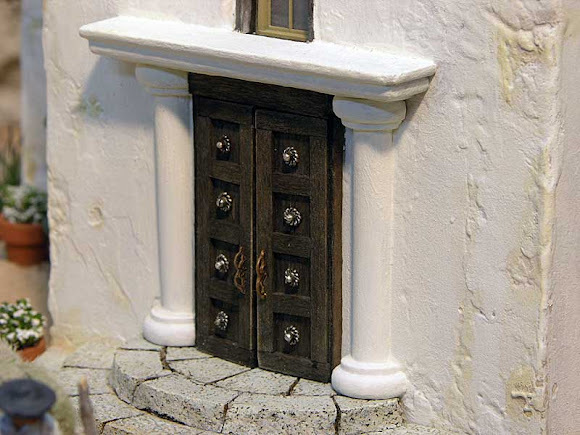 The white metal castings were painted dull silver and weathered with paint and chalks. Elastic thread, painted a metallic gray, was used for the cables. 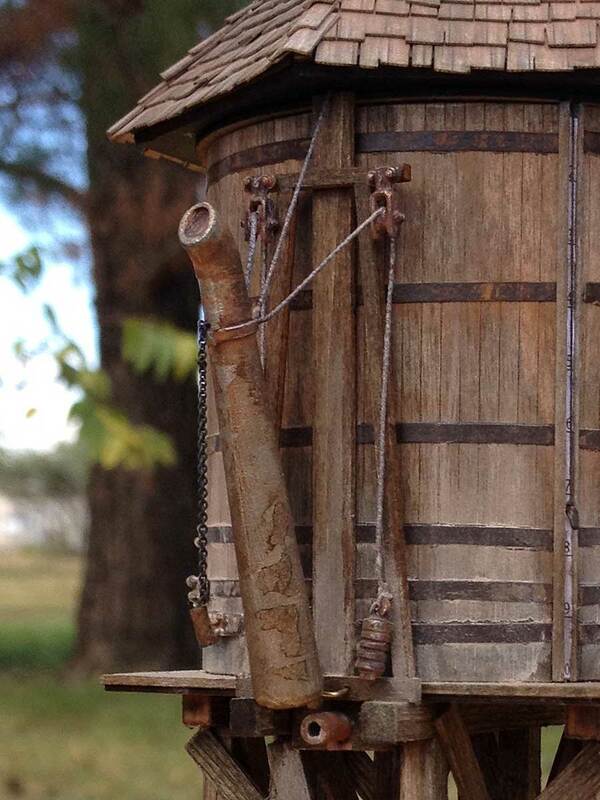 I added a short length of blackened brass chain with a wooden handle to allow crews to pull down the spout. 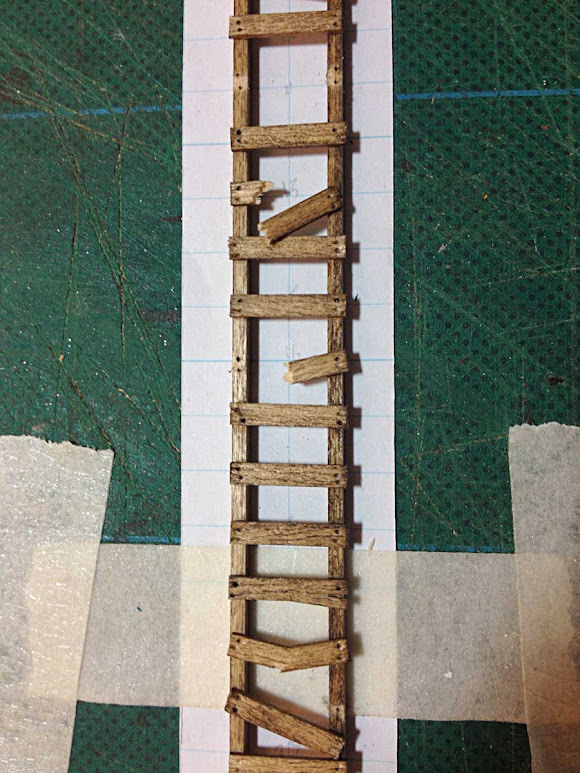 The ladder was aligned to access the roof hatch and then glued in place using some leftover strip-wood as supports. 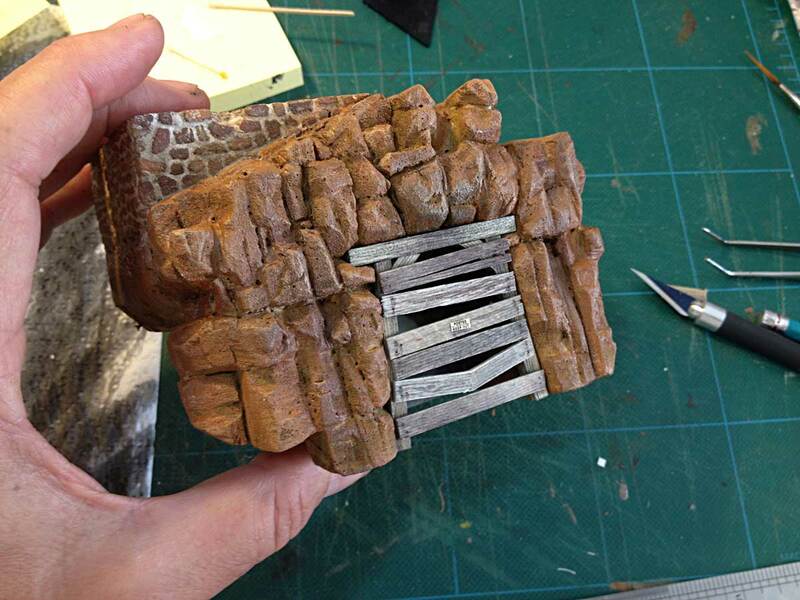 Some of the last details added were these "concrete" footings made from strips of painted illustration board. Final weathering was done with more powdered chalks mixed with 70% isopropyl alcohol and painted on with a brush. The white mineral stains were brushed upwards from the bottom and rust was stippled onto the tank bands and other metal hardware. Once the alcohol evaporates the chalk colors can be quite strong but they are easily blended in and made more subtle by scrubbing with a stiff brush. 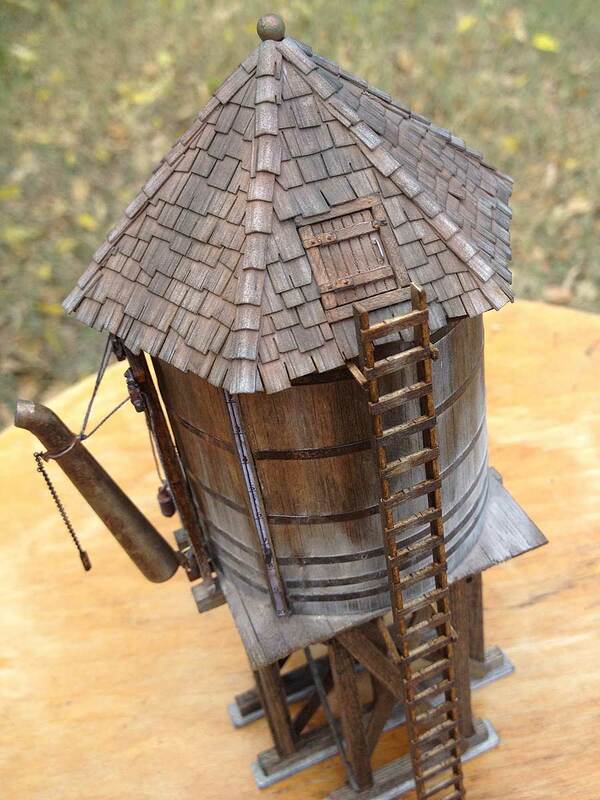 Building the water tank was a fun project and I'm very pleased with the way it all came together. 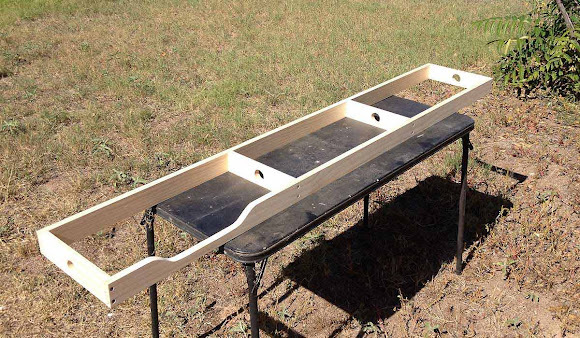 Bill Banta makes a fine kit that lends itself well to all sorts of kit-bashing possibilities. I look forward to planting the tank on the layout and working in the ground cover and other details to complete the scene. As always, thanks for following along, questions or comments are welcome below. Adios for now! Thunder Mesa tank, ready to service locomotives on the TMMC.